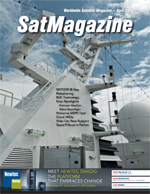 Solid State Power Block Upconverters (SSPBs or High Power BUCs) have long been a mainstay technology for maritime ship-to-shore satellite communications systems. Polar markets have traditionally been an afterthought of a region for broadband access. The Challenges Of Satellite Communication @ Sea, By Stav Gizunterman, Head of Product Marketing, and Guy Naym, Communication Solutions Expert, ORBIT Communication Systems Ltd.
Satellite communications have earned their rightful place in the arsenal of communication solutions for a truly connected world and are often the only viable solution for remote areas. At NewCom, we believe that education is the key to advancing a country—both in terms of improving quality of life and driving innovation and economic growth. One of the most interesting SATCOM applications today appears to be in the field of providing Internet access onboard commercial airplanes. We all know that the introduction of networks based on multi-spot beam satellites has reduced bandwidth costs. Mr. Blake has overseen Spaceflight Services’ first four commercial rideshare launches, on the Antares, Soyuz and Dnepr vehicles, from sales to mission management to launch. The University of Michigan (UoM) solar car team began racing in 1990, winning the inaugural American Solar Challenge with its first car, Sunrunner. The space industry is—without question—one of the hottest sectors of the overall aerospace and defense (A&D) industry. This sector’s current transformation is being marked by dramatic and potentially disruptive shifts, as suppliers aim for industrialized production levels while dealing with a heady mix of innovative new customers and competitors.